Wow, today is the last block of the Summer Sampler Series! 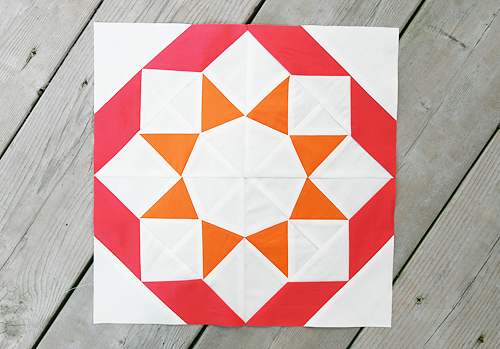 Head on over the Lee's blog for a tutorial on block twelve, the Kansas Dust Storm quilt block. As always, feel free to post your photos and any questions in the Flickr group. I want to thank everyone for quilting along with us. I have really appreciated your wonderful comments and emails over the last 4 weeks. So many people, myself included, learned new skills and accomplished things they never would have tried before. I had a great time cohosting this quilt along with Katie and Lee. We have never met in person and tackling something as big as a quilt along, with a lot of people depending on you, is no small task. We were all required to figure out the block construction on our own - quite the challenge at times. They both have worked so hard, been so dependable, I can't say enough good things about teaming up with them. Big thanks to you Katie and Lee! I do plan on assembling my quilt top soon. I just need to decide if I want to do sashing, cornerstones, etc. Lee plans on having her top done by next Friday, so check back then for more details!